Whether you are a seasoned camper or first-timer you will enjoy the Family Camping experience at a Maine State Park campground. Many families make our parks their summer tradition. Join us! 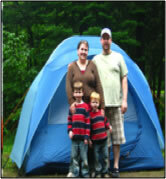 Family Camping sites are for one family1 or groups of 6 or fewer people. ¹ A family is defined as parents and all their unmarried children age 18 years and younger. When you make an online reservation you can search for sites that will fit your RV or tent and among all the amenities we offer. Each Family Campsite has a picnic table and grill. 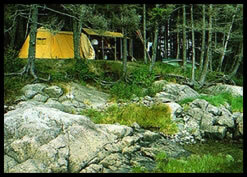 Larger families and groups may make reservations at our Group campsites. Pets are allowed at all campgrounds except Sebago Lake State Park Campground; they must be kept on a leash under the physical control of the handler and must not be left unattended. Pet waste must be picked up immediately and disposed of properly. Educational and recreational programs are offered at many of our Family Campgrounds and include special evening and campfire sessions. Call the park to get a copy of their schedule. For the events open to both campers and day visitors visit our searchable calendar of events. Playgrounds are available at many of the parks. Use our Park Search feature to learn more about the parks and view the amenities each offers. If you and your family are seasoned campers you may want to try a backcountry camping experience on the Public Reserved Lands. 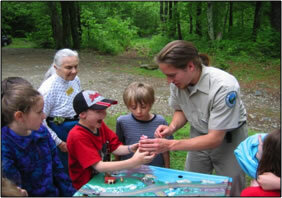 Accessible sites are offered at mainland Family Campgrounds. For specific details contact the park in advance.